A Pomchi dog is a crossbreed Pomeranian Chihuahua mix. Often described as an alert, graceful and smart pup of small proportions. In this complete guide we will give you a clear picture of what possibilities to expect from a Pomchi. As with a mixed breed, it can be rather unpredictable! Many know this mix as “Pomchi.” However, other cute and clever names include Chipom, Chimeranian, and Pomahuahua. Pomchi dogs are playful and good with kids and other pets. This pooch is a loving, friendly character who does not usually have the “stranger-danger” outlook of a vigilant guard dog! The worldwide trend for small designer dogs makes the Pomchi a popular choice. But Pomeranian Chihuahua mix puppies have the potential to inherit any aspect of either breed. Even littermates may appear and behave very differently due to a lopsided allocation of traits from the parents. Some of the half Pomeranian and half Chihuahua puppies may exhibit the physical features of one breed and the behavioral tendencies of the other, with the rest of the litter the exact opposite! Nonetheless, the Pomeranian Chihuahua mix usually reflects the inherent intelligence of both parents. The Pomchi’s high canine IQ makes training fairly easy. This is a good thing considering her reputation for having an active motor and proclivity to bark and howl. The Pomchi dog’s parents are strikingly similar in many aspects. Each is a toy breed, compact, spunky, intelligent, and curious. Poms come from German Spitz dogs. Spitz-type dogs were originally big, working canines found in the Arctic area. How did the little dog that we know and love today, undergo such a downsize? Queen Victoria may have had some influence on the size of Pomeranian. In 1891, she exhibited a relatively small Pom. This caused demand for the smaller version of the breed. It is believed that the breed’s normative size was halved through selective breeding in the years that followed. The first Pomeranian breed club was established in England in the late 19th century. Around this time, the American Kennel Club also registered its first Pom. Today, the Pom remains a perennial Top 20 choice of dog among US owners. Named after a state in Mexico, the perky Chihuahua lays claim to the title of smallest dog breed. Chihuahuas are a talkative, confident, and independent toy dog. Archaeological records show that Chihuahuas originated in Mexico. The earliest mentions depictions of the breed are from around 100 AD. Much later (circa 1500), the Aztecs apparently sold the dog for sustenance purposes. They were commonly used as a sort of early-edition hot water bottle for the sick or injured! Depictions of a Chihuahua-like dog have been found throughout Central America. Many believe the breed descended from a Toltec civilization dog. This tenacious little dog has come a long way since. The American Kennel Club registered its first Chihuahua in 1904, and the breed upped its celebrity status with a starring role in the 2008 movie, Beverly Hills Chihuahua. Pomeranians hover around the 6 inches mark and average 3-7 pounds. Their lifespans range from around 7 to 12 years. Chihuahuas typically stand from 6 to 9 inches tall, and weigh from 3 to 6 pounds. Healthy Chihuahuas have long lifespans: roughly one to two decades! So, what can we expect a Pomeranian x Chihuahua mix to look like full grown? This little fellow will stand 7 inches to 1 foot tall, and weigh 3 to 7 pounds, mirroring the dimensions of his parents. A teacup Pomchi is one that is particularly small, with dimensions at the extreme end of the spectrum. But even full grown Pomchi dogs are diminutive. Children and other animals should play gently. 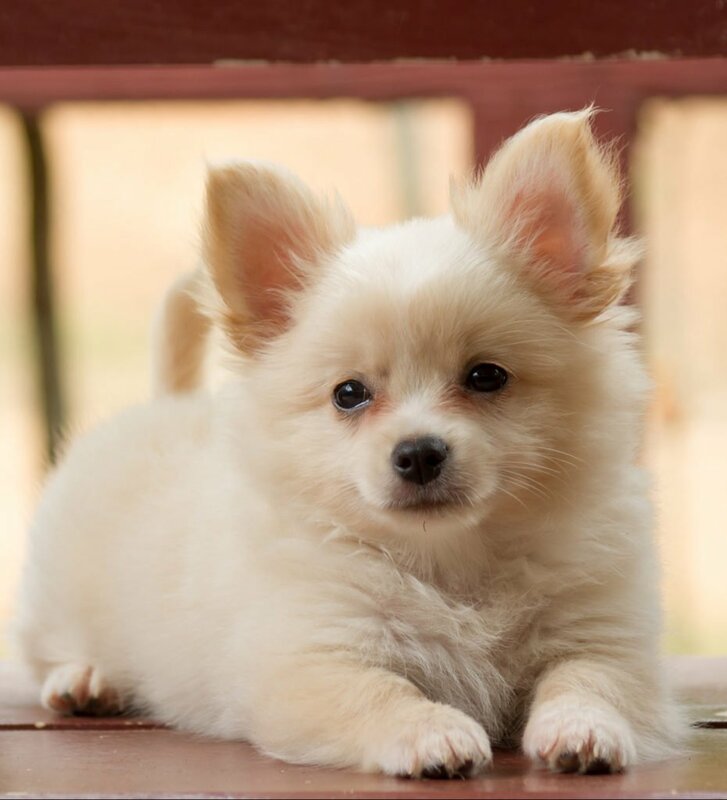 Pomchi fur is one of the most unpredictable aspects of this mixed-breed. Single or double coats, and short- or medium-length fur? This depends on which genes are inherited from the parents. Likewise, the Pomchi has inherited several possible color combinations, including single, bi, and tri-colored fur. Whether you have a black Pomchi, a white Pomchi, or a glorious mixture of fur color combinations, he will require regular brushing to maintain a healthy and manageable coat. Longhaired Chihuahua Pomeranian mix dogs need a daily brush. Many designer dogs are given stylish hairdos. You are free to choose the Pomchi haircut that you and your little buddy prefer! 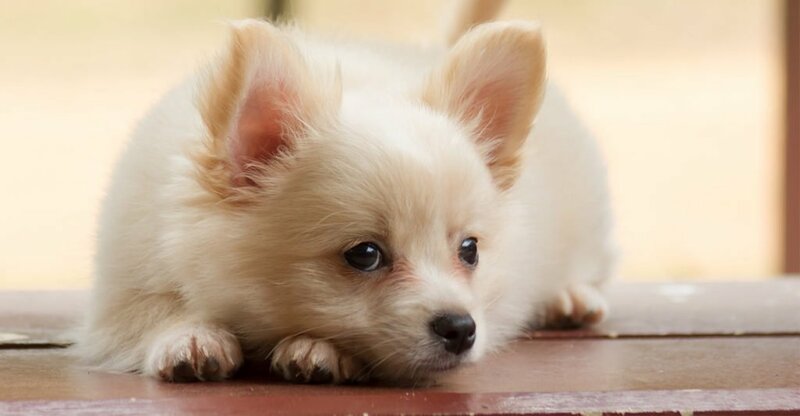 Pomchi puppies inherit the habits, tendencies, and temperamental leanings of their parents. Unfortunately, you can’t cherry-pick preferable Pomeranian x Chihuahua traits. If you decide upon a Pom Chihuahua mix you could be getting any aspect of either parent dog. Chihuahua owners may agree their pups have a reputation for stubbornness. Pomeranian owners will tell you their dogs are extroverts, eager to show off their cleverness! So it comes as no surprise that most Pomchi owners describe their dogs as personable and outgoing. They also make excellent lap dogs and travel companions, due in no small part to their portable size. Early socialization and training will aid the active Pomchi dog in learning to mind his manners. However, he may be tempted to nip or bite if people try roughhousing with him. As a side note, some owners may need to train their pooch on how to curb the habit of barking excessively. Overall, a compact Pomchi is suited for apartment living. These dogs can manage just fine if mom or dad have to go to work during the day. Her level of self-sufficiency also makes Pomchi dogs an appropriate choice for first-time owners. To anticipate a Pomchi’s future health issues, we must understand the medical conditions that he may inherit from either parent. Chihuahuas have reputations for being fairly healthy purebred dogs. However, they are prone to eye, heart and joint issues just like other breeds. Luxating patella is a condition in which the knee cap slips out of place. It’s not specific to the Chihuahua breed, but it is not uncommon in this small dog. Chihuahuas also have an increased risk of collapsed trachea and hydrocephalus (accumulated fluid on the brain). Many experts believe that overfeeding can contribute to some of the Chihuahua’s health issues, not to mention unwanted obesity. Pomeranians are also at risk for patella luxation. They should not be allowed to jump down from great heights, in order to protect their knee joints. Pomeranians are also known to have issues with sensitive skin and alopecia (hair loss). Tracheal collapse results in a closed airway and is characterized by a loud, harsh cough. This is most common in small breed dogs, including the Chihuahua and the Pomeranian. The Pomchi should also be monitored for the condition. The typical and expected lifespans of mixed-breed dogs mirror those of its parent breeds. In the case of the Pomchi, this dynamic little canine is fortunate to have inherited robust longevity genes from each parent. A healthy Pomchi dog will live from 10 to 18 years, depending on his health, environment, etc. It is important to work with a responsible breeder who understands the health risks within the Pomchi’s parent breeds. Such breeders use genetic testing and will readily share the health certificates of your dog’s parents. It is not a certainty that your puppy will exhibit the health problems in his parents’ backgrounds. But it is wise to know his detailed medical history so that you can make an informed decision, prior to making a lifetime commitment. If you know the medical conditions a Pomchi is predisposed to, you can be vigilant to signs of the diseases or conditions that could crop up down the road. Love-at-first-sight-syndrome is common when humans meet puppies: especially those as charming and winsome as the charismatic Pomchi. But in all the excitement of new ownership, it’s easy to lose sight of some hard realities. It is always important to inquire about a mixed-breed puppy’s health prior to making a commitment. In the case of the Pomchi dog, it is possible to inherit any medical condition the parents are at risk of. In any gallery of Pomchi puppy pictures you will see an assortment of curious and sunny little faces looking back at you. The Pomchi has a round head that narrows down to a wedge-shaped muzzle. A Pomchi’s ears are pointy and stand either erect or flop over toward the face. Add in bright round eyes and dark button noses, and it’s easy to be smitten with a Pomchi. Are you wondering how much a Pomchi pup costs? Online prices start at just a bit over $200, with many pups advertised in the mid-range of $500-700. A select few command prices closer to $1,000. Do Pomchi Dogs Make Good Pets? We hope that you enjoyed learning more about the tiny, precious Pomchi cross breed. She will most certainly be a mixed bag of traits, qualities, and features inherited from her Pomeranian and Chihuahua parents. Pomchi’s temperamental characteristics are playfulness, trainability, alertness, loyalty, and likely a bit of a stubborn streak. Pomchi puppies will benefit from early and positive training and socialization in order to help them learn boundaries and manners. A properly trained Pomchi should get along well with children and other dogs who treat it with respect and don’t try to roughhouse. The Pomchi dog enjoys doing things with its humans, including mild walking and more sedate activities like snuggling in a warm lap. A bit of daily exercise, nothing too strenuous, is enough to keep your Pomchi active, happy, and fit. He is conducive to apartment living and his small stature lends itself to transport and travel. This toy pooch, described as loyal and outgoing by owners, will likely be a loving companion. If these qualities sound like the ones you’re looking for in a canine companion, then the adorable Pomchi may be the dog for you. Do you already have a Pomchi as a pet? If so we would love to hear about your pet parent experiences in the comment section below!